Daragh Walsh netted the winning penalty and Ireland defeated England 4-3 in a shootout in their playoff match at the Four Nations Tournament in Valencia. The sides drew 2-2 in normal time as Ireland twice came from behind, Zach Wallace gave England the lead in the second half before Eugene Magee levelled. A Luke Taylor penalty corner restored England's lead before Sean Murray netted a late equaliser with just four minutes remaining to take the game to a shootout. It was a strongly contested opening quarter with the ball changing possession frequently. Both defences protected their circles well and chances were kept to a minimum. This continued after the break but it was England who began to settle on the ball and James Gall fired narrowly wide just as England ended the half on top. After the break England flew out the traps and took the lead. A great run down the right from Barry Middleton saw him take the ball to the baseline, his cut back found Wallace who cleverly fired into the roof of the net on the reverse to score his first international goal. Ireland were level though almost immediately, Robson found space and fired across goal for Magee to finish from close range. England won a penalty corner from the restart and Mark Gleghorne's low effort was brilliantly saved by David Fitzgerald. England pressed hard for a winner in the final fifteen minutes. Another penalty corner saw them go close as Taylor's effort was saved and the rebound hammered into the bar. On 49 minutes from another corner England edged ahead though as Taylor fired another drag-flick towards goal and it snuck past the goalkeeper. However with four minutes remaining Ireland drew level, Murray ran into the England circle and lifted the ball past the keeper into the net. Ireland had good chances to grab a late winner but Pinner twice made smart stops to keep the score at 2-2 and the game headed to shootout. Harry Martin, Zach Wallace and Adam Dixon were on target for England while Magee, Sothern, O'Donoghue converted for Ireland but it was Daragh Walsh who netted the winning penalty. There was nothing to separate the two sides for much of the opening half. Mark Gleghorne and the English defence were content to pass the ball around the back in search of an opening that rarely appeared. Likewise, the Green Machine held the ball for long phases and sent crash balls into the English 23 but neither GK was really challenged. The chance of the half fell to James Gall as he took advantage of Conor Harte slipping but his shot was forced wide with good pressure from Michael Robson and David Fitzgerald. The game came to life in the second half with 2 goals inside the first 6 minutes. Barry Middleton broke down the right-hand side and sent the ball across the circle for Zachary Wallace to score at the back post. But minutes later and Eugene Magee’s deflection was the equaliser from a superb pass from Michael Robson. Ireland appeared to have the upper hand and won 2 penalty corners in quick succession, the latter of the two resulting in a disallowed goal. England were perhaps lucky to take the lead in the 49thfrom a penalty corner drag by Luke Taylor as the ball didn’t appear to leave the circle on the push out. But Sean Murray drew the game level in the 56thminute with a close-range shot following a great run and pass by Shane O’Donoghue. A last gasp penalty corner drag from O’Donoghue was well saved from George Pinner to keep to the game at 2-2 when the final whistle sounded, sending the game to a shootout to decide the final placings. Magee, Alan Sothern, O’Donoghue and Daragh Walsh all got on the scoresheet to secure the victory combined with 2 super saves from Fitzgerald. Ireland finished off a gruelling five games in seven days in Valencia on a high with a shoot-out win over England to finish third in their Four Nations World Cup warm-up tournament. Normal time had ended 2-2 with the English surviving a late onslaught to see it to shoot-out but Ireland kept their nerve to score a strong result. The first half saw little goalmouth action and ended scoreless with Chris Griffiths’ diving effort hitting the outside of the goal the pick of the chances. The second was far livelier. Jeremy Duncan hit the post from one attack with the clearance seeing England go in front via a Zach Wallace finish following an excellent break down the right wing, the forward diving to finish off. Eugene Magee levelled following an excellent spell of possession play eventually opened the door for Michael Robson to get free down the left of the circle. He fired a reverse across goal where Magee was on hand to guide in. Luke Taylor restored the English lead from a corner, one which Ireland debated, suggesting the stop for his drag had been inside the circle. But Ireland hit back when Sean Murray chipped over George Pinner following an excellent Shane O’Donoghue burst from midfield, racing into acres of space before picking out the Rotterdam-based player. In a scrappy last few minutes, marked by plenty of players suffering injuries, Ireland had three corners and another effort scraped off the line. In the shoot-out, Robson missed in the first round but an otherwise perfect set, completed by two Dave Fitzgerald saves and Daragh Walsh’s flick in the fifth round won it 4-3. Ireland’s next meeting with England, though, is the important one on December 7th when they play in their third group game in India. The tournament itself was something of a mixed bag with Alexander Cox knowing there is plenty to work on following his first competitive games in charge. The opening win over England and close-run 1-0 loss to Spain were contrasted with a heavy 7-1 defeat to the Netherlands. In a rematch with the Dutch on Saturday, Mitch Darling and Alan Sothern put Ireland 2-0 up only to lose out 5-2 with two goals in the last two minutes. How to assess the 4 Nations tournament in Valencia? Spain finished top of the round robin, England couldn’t find a win, Spain beat Netherlands and then the Dutch narrowly beat the hosts in the final. With no live streaming available from the early stages, it is hard to fathom whether teams were holding anything back ahead of the World Cup. But the fact of the matter is that these are capped internationals and friendlies are for trying out training ground tactics. And Ireland will head to the World Cup in buoyant mood after two victories over pool rivals England, who had plenty of new faces still finding their feet as well as missing the services of top scorer Sam Ward, nursing a minor injury back home. Ireland now have three wins from five matches stretching back to their breakthrough display against England at the 2015 EuroHockey Championships. Their final pool stage match on December 7 could likely decide who progresses and which nation enters the cross over matches, with world No 1 and defending champions Australia favourites to qualify top. On Sunday England ended their Valencia campaign with a shoot out defeat to the Irish as Alexander Cox’s side clawed their way back into the match with a late strike. The sides drew 2-2 in normal time as Ireland twice came from behind, Zach Wallace handing England the lead in the second half before Eugene Magee levelled. A Luke Taylor penalty corner then restored England’s lead before Sean Murray netted a late equaliser with just four minutes remaining and goalkeeper George Pinner smartly stopping twice late on as well. Harry Martin, Zach Wallace and Adam Dixon were on target for England, with Phil Roper Barry Middleton missing, while Magee, Sothern, O’Donoghue converted for Ireland and Daragh Walsh netting the winning penalty. Plenty to ponder, then. First blood to Ireland, who along with Spain are also two sides who will not play a part in the inaugural Pro League. The South African Men’s Hockey team took on France in the second test match of the series at Wits Hockey Astro this afternoon after the opening game had been drawn 2-2. The match marked the 150th cap for 2016 SA Hockey Player of the Year Rhett Halkett and the lads were looking to build on the positive showing from Saturday. And they did that for the opening 25 minutes, including for a 10-minute phase where they were a player short due to Tommy Hammonds yellow card. Employing a more possession-based game than in the opening match the South African men were unlucky not to take an early lead when Peabo Lembethe hit the post from the first penalty corner, while Austin Smith was also denied by Thierrfly in the French goal. The South Africans were growing in the game and the likes of Taine Paton, Mohamed Mea and Taylor Dart were seeing plenty of ball in creating pockets of space for players to run into. But on old foe of South African Hockey struck its head as the finishing was not clinical enough. Having weathered the storm France landed the double sucker punch before half time. Timothee Clement was not closed quickly enough and left one-on-one with Rassie Pieterse and he finished superbly. Just 60 seconds later they landed the second with a superb finish by Maximillen Branicki firing home a tomahawk passed Pieterse. The second half featured much of the same with South Africa lacking the devastating blow, while France delivered a double punch in the third quarter. Victor Charlet converted both penalty corners that France won, making it 3 out of 3 for the series, to give the French a 4-0 lead. What was refreshing from the South Africans however was the refusal to stop fighting and they created a few great opportunities through Nqobile “Bili” Ntuli, Julian Hykes and Taylor Dart but were unable to score. They did get their consolation goal right at the end when a good penalty corner variation saw Julian Hykes get his second of the tournament. The third test was incredibly the French 19th test match of the year, while it’s only the 7th for South Africa, further highlighting the difficulty that South Africa face in getting test match action. The week ahead however will be a great opportunity for the team to stay and train together, which will be highly valuable for the World Cup preparations, before the third and fourth test match next weekend. The third test match will be on Friday 9 November at 16:30. Australia's women's Under-23 Development Team have started their China Tour with a win and a loss over the weekend in Changzhou. Australia went down 3-2 to hosts China on Saturday, before recording a 2-0 victory over local champions Jiangsu on Sunday. Hockeyroo Mariah Williams, returning from injury, has starred with three goals across the two games. Saturday's 3-2 loss saw Williams net from a penalty corner in the second quarter, before a late penalty stroke with the side blooding nine debutants. On Sunday, Williams scored in the first quarter before Miki Spano added the second in the third to claim a 2-0 win. The side is next in action on Tuesday from 2pm AEDT against Great Britain. Leaders Surbiton and second-placed rivals Hampstead and Westminster battled to a 2-2 draw in the Men’s Hockey League Premier Division on Saturday. Meanwhile, third-placed Holcombe narrowed the gap to just one point with a hard-fought 3-2 win over top flight newcomers the University of Exeter. Surbiton started the brightest as Alan Forsyth slotted home from open play in the fourth minute. But Hampstead were quick to respond through a goal from Paul Melkert in the 11th minute. Tim Atkins regained the lead for Surbiton before half time when he found the net in the 29th minute. But Rupert Shipperley equalised for the away side in the 48th from a penalty corner with what proved to be the final goal. Nicholas Bandurak scored a brace and Robert Field scored one to secure the points for Holcombe against the University of Exeter. Ben Cooke and James Ferguson both scored for the visitors, but it was in vain as the newly-promoted side are still looking for their first win of the campaign. Elsewhere, Beeston and Wimbledon drew 2-2 to share the spoils. Peter Small and Ben Tibble scored for Wimbledon and Joe Sharp and James Albery were the scorers for Beeston. Brooklands Manchester University versus East Grinstead also ended in stalemate as the teams played out a 3-3 draw. Andy Jackson, Richard Slater and Thomas Russell were all on the scoresheet for Brooklands. Simon Faulkner, Andy Piper and Samad Suleman were the goal scorers for East Grinstead as both teams secured a point each. Sevenoaks and Reading also ended in a draw, the full-time score being 0-0. The University of Birmingham kept their unbeaten run going with a 3-1 victory over Chichester in the Men’s Conference West. Eddie Way opened the scoring for the league leaders and eventually sealed the game with a last-minute penalty corner after Chichester threatened to edge back into the game. Elsewhere Cardiff & Met and Olton & West Warwickshire overcame their opponents to keep in touch of first spot. Jack Pritchard netted twice for Cardiff & Met in a 2-1 win over Team Bath Buccaneers, whilst Peter Jackson matched that for Olton in a 3-1 win over Fareham. Charlie Stubbings was also on hand for a brace of penalty strokes to guide Havant to a 3-1 win over University of Bristol whilst Oxford Hawks beat Isca by the same scoreline. Old Georgians were in ruthless form and retained top spot by beating Brighton & Hove Albion 6-1 in the Men’s Conference East. Brighton & Hove held their own in the first half but were engulfed by the visitors who hit four second half goals, two coming from Edward Carson. Oxted kept pace and assured they would only remain a point adrift at the close of the weekend with a 2-0 victory over City of Peterborough who lie seventh. Canterbury fell to Teddington 4-3 to dint their title hopes in a game that racked up three braces. Old Loughtonians took the three points to leapfrog weekend opponents Cambridge City in a 3-2 win, while Southgate and Richmond played out a 2-2 draw. The University of Nottingham closed the gap at the top of the table by securing a 4-0 victory at home to Preston in the Men’s Conference North. Sean Cicchi, Michael Nicholson, Sebastian Dorignaux and Noah Darlington were all on the scoresheet for the University of Nottingham. 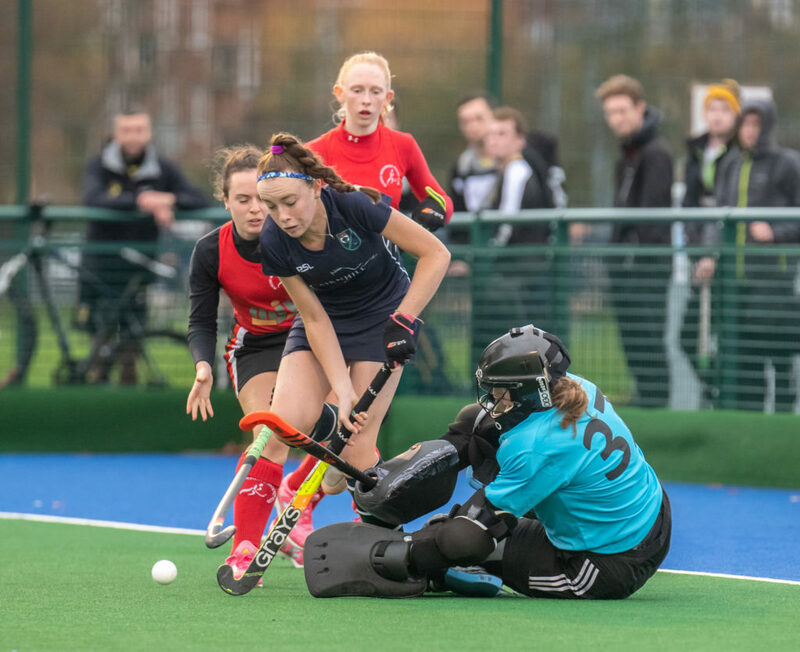 The University of Durham produced a good performance at home to top of the table Bowdon, winning 2-1 to narrow the gap on the leaders to three points. Elsewhere Belper won 3-2 at home against bottom of the table Alderley Edge to lift them off the foot of the table, whereas Loughborough Students and Leeds played out a 2-2 draw. The South Yorkshire clash between Sheffield Hallam and Doncaster ended with Hallam prevailing 2-1 victors. Premier Division: Brooklands Manchester University 3, East Grinstead 3; Holcombe 3, University of Exeter 2; Sevenoaks 0, Reading 0; Surbiton 2, Hampstead & Westminster 2; Wimbledon 2, Beeston 2. Conference West: Cardiff & Met 2-1 Team Bath Buccaneers; Fareham 1-3 Olton & West Warwicks; Havant 3-1 University of Bristol; Isca 1-3 Oxford Hawks; University of Birmingham 3-1 Chichester. Conference East: Brighton & Hove 1-6 Old Georgians; Cambridge City 2-3 Old Loughtonians; Canterbury 3-4 Teddington; Oxted 2-0 City of Peterborough; Southgate 2-2 Richmond. Conference North: Belper 3-2 Alderley Edge; Doncaster 1-2 Sheffield Hallam; Loughborough Students 2-2 Leeds; University of Durham 2-1 Bowdon; University of Nottingham 4-0 Preston. All square across the board in the two men’s EY Hockey League on Saturday means that Glenanne were unable to close the gap significantly on Banbridge at the top while it is as you were in the bottom three. The Glens came three times to draw with basement side YMCA but will rue the fact they have only take three points from nine so far against the bottom three teams after a 3-3 draw. Jamie Tobin gave the Y an early lead before Sam O’Connor tied it up in the 16th minute; Ben Campbell made it 2-1 at half-time only for Gary Shaw’s corner switch to have it level going into the final quarter. Again, Tobin put YM in front but Brad Venter levelled it with seven minutes to go. In Cork, C of I got their third draw from five games to remain in ninth place in the division, two points below their opponents Cookstown after a 1-1 draw at Garryduff. Greg Allen finished off a classy first goal for the Co Tyrone side for 1-0. Jonny Bruton equalised in the second quarter from an excellent move, laid on by John Jermyn. The second half saw C of I have more of the game but they could not find the breakthrough and so had to be content with another draw. The remainder of the games in this series were switched due to the international series for Ireland in Spain where the Green Machine ended on a high, beating England in a shoot-out after 2-2 draw in normal time to finish third. In EYHL2, there was a full round of matches with plenty of goals going around. UCD beat Bandon 2-1 in west Cork for an important result with David Nolan and Andrew Tutty scoring in the first quarter to set the tone. They move on to four points, level with Railway Union at the head of Pool 1. The Sandymount side were 7-2 winners at Bangor. In Pool 2, Corinthian are top on their own thanks to a 5-2 win over Instonians, scoring four times in the first 21 minutes to fire their victory. Kilkeel came from behind to beat UCC 5-1. Draw-masters Cork C of I tied for a third time this season, leaving them in ninth place, two behind Cookstown following a closely fought battle in the rain at Garryduff. Cookstown were initially content to sit deep and play on the counter but they took full advantage when Jonny Bruton was in the sin-bin on a green card. In his absence, they took the lead via a lovely interchange on the endline with Greg Allen on hand to finish off. C of I improved markedly from there with Stephen Parker having an effort disallowed while Josh McCabe was called on to save a John Jermyn corner and David Lynch’s follow-up before the end of the first quarter. French arrival Thomas Chalemeau went just wide before Bruton levelled the game at 1-1. A free outside the circle was played to Chalemeau who found Jermyn. He squared the ball on his reverse to Bruton to net. The hosts continued to have most of the ball with Cookstown looking ready to pounce on the counter. Alec Moffett’s reverse was the pick of the chances in the third quarter. The final period saw a yellow card apiece while Cookstown won two corners while C of I had a shout for a stroke turned down after Alex Burns went down in the circle but nothing accrued, leaving the sides to settle for a point each. 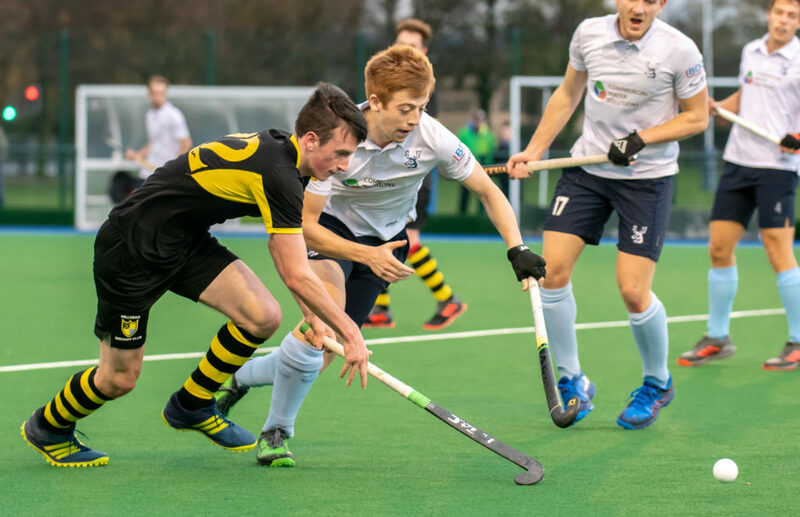 Glenanne fought back three times to keep up their unbeaten record, denying YMCA their first win in the men’s EY Hockey League in a high action draw at Wesley College. The Y started off in superb style, Jamie Tobin slotting in after nice play from Ben Campbell down the left hand side. They had three corner chances, too, in the first quarter but were caught by Glenanne’s first attack of note when Sam O’Connor made a lovely run to the baseline and dinked over Jakim Bernsden. The hosts got back in front soon after when Daniel Ellison showed great skill and strength as the ball was switched out wide and then slapped into the middle. A first-time touch from Cillian Hynes fell to Campbell who took his time before picking his line to goal and 2-1. YM held that lead into half-time despite a Glenanne corner and a yellow card for Jonathan Codd. The visitors, however, did get level for a second time soon after the big break from another corner – with reduced numbers for Sam Hyland going too early – a slip move to Gary Shaw who slapped in. It was end to end with both sides having further chances from the set piece but remained 2-2 into the third break. Tobin gave YM the lead for a third time early in the fourth quarter when Grant Glutz showed some nice skill to set up Aaron Bailey; his shot was saved but Tobin slammed in the rebound. Glutz almost sealed the win when his sliding deflection hit the crossbar and they had a couple of further chances to go further in front only to be stung by a Glens’ corner, Brad Venter deflecting home with seven minutes left. They looked the more likely to win it after that with another corner and a four on two chance that required a huge Will Powderly tackle to ensure it stayed 3-3. UCD held on for an important Pool 1 win in Bandon as two goals in the first quarter put them on course for a 2-1 result in west Cork. David Nolan slapped in a clever corner slip to make it 1-0 and Andrew Tutty weighed in with the second soon after. Bandon had the best of it after half time with Mark Collins and Clinton Sweetnam going close. Bandon missed a stroke before Fionn O’Leary got a corner goal with seven minutes to go but no equaliser was forthcoming. Railway Union moved to the top of Pool 1 on goal difference thanks to their 7-2 win at Bangor. Andrew McGregor and Richard Forrest put the Dubliners 2-0 up at the end of the first quarter and Eoin MacArthur added a third before half-time. Joel Easlea and Simon McKeever traded goals in the third quarter to advance the lead to 4-1. Michael McKenzie, Fergal Keaveney and Jeremy McKeever then added more pain on Bangor for whom Rhys Cunningham got their second. In Pool 2, Corinthian swept to a 5-2 win over Instonians with four goals in the first 21 minutes putting them in superb shape in the group. Ian Stewart and Davy Howard fired twin drag flicks to make it 2-0 at the end of the first quarter before a super strike from George Dagg and a brilliant reverse from Stewart had them four to the good. Gavin Lecky got one back before half-time from a corner and he added another with seven minutes to go before Jack Perdue scored another for the reds to leave them top of the group on six points. Kilkeel joined Inst on three points when they came from a goal down to beat UCC 5-1 at the Mardyke. John Costello – from Eoin Finnegan’s assist – put the Cork side in front inside four minutes. But two goals in quick succession in the second quarter from Luke Russell and Ashton Graham swapped the lead and Kilkeel did not look back. Jonathan Aiken made it 3-1 at the break before Mark Stevenson’s stroke and another Russell goal concluded the victory in the last seven minutes. Grange maintained their lead in Men’s National League 1 with a 3-1 win over Hillhead. A first half field goal by James Nairn gave Grange the edge, which they extended in the second half with two goals by Dylan Bean, the second from a penalty corner. A late penalty stroke for Hillhead proved too little too late but they are still in the top four, equal on points with Grove Menzieshill. Grove Menzieshill were back on form, at least in the second half against Edinburgh University, with a 4-1 victory that keeps them well placed in the top four. Kevin Wong gave Edinburgh an early lead but Paul Martin equalised some ten minutes before the interval in what was an evenly contested first half. There was a dramatic shift in the second period as Grove Menzieshill netted two goals in quick succession to effectively tie up the points. Ben Cosgrove and Aidan McQuade following a penalty corner did the damage. Cameron Golden completed the scoring midway through the second half. Three goals by Chris Boyle were insufficient for Uddingston as Western Wildcats netted five to maintain their challenge behind Grange. A free scoring, entertaining match at Auchenhowie saw Western pegged back twice, but the home side came through to secure a well-earned victory in the last 15 minutes. Rob Harwood opened the scoring early on, followed by two set pieces from Hamish Galt. The 4th goal fell to Andrew McConnell before Mackenzie sealed the win with a drag flick in the last minute. Watsonians hit Clydesdale for five at Titwood with an excellent 5-1 victory on the road in Glasgow. It’s a big win for the Edinburgh side against a Clydesdale team who had made an excellent start to the season. Goals for Cain, Heigh, Cochrane, Wynd, and Burgess did the damage. Kelburne put seven strikes past Gordonians, with none in reply, at the Glasgow National Hockey Centre to add more points to the board for the Paisley side. Clydesdale Western moved into second place behind Edinburgh University with an ultimately convincing 3-1 win over Watsonians. A double by Heather Howie and a single by Ali Eadie saw Western move up to second place behind Edinburgh University. But Watsonians were the better team in the first half and led with a goal by Heather Tait. However the second period saw Clydesdale in more clinical form in front of goal to take the three points. Dundee Wanderers had the opportunity to maintain their position but could only draw with GHK. Wanderers had looked on course for their sixth win but let a two-goal lead slip. Georgia Crooks and Lucy Williamson scored for GHK to take a much needed and well-earned point. Western Wildcats maintained their challenge in the top four with a comfortable win over Glasgow university. But Glasgow made them work all the way after a goalless first half. Emily Powell’s goal turned the match in Wildcats’ favour and Catriona Booth sealed the points from a penalty corner flick. Hillhead were the victors their clash with Grange in Glasgow, and took the points courtesy of a 2-0 win. The points for Hillhead widens the gap at the bottom with Grange six points shy of the Glasgow side. Dutchman Merteen Fonteyn scored one goal and made one assist as Butali Sugar silence United States International University 2-0 at City Park on Sunday to reclaim their men’s hockey Premier League lead. It’s in the third quarter that Butali Sugar managed to break USIU defence when Zack Aura floated the ball from the left before Fonteyn drew first blood in the 43rd minute. Then in the last quarter, Aura played Fonteyn through before finding Vincent Odhiambo to sweep in the second goal with seconds to go. The victory saw Butali Sugar reclaim the league’s lead from champions Kenya Police on better goal difference as both teams tie on 51 points each. Police had claimed the lead on Saturday when they beat Wazalendo 16-2 in a controversial match that was marred by protests and poor officiating. While Police have - who have 17 wins and one loss - have four matches to go, Butali Sugar Warriors - who have 17 wins and two losses - have three matches to wind up the season. “We lacked patience and my players were under pressure after what happened in Police verses Wazalendo match,” said Butali coach Dennis Owoka, who said they will write to Kenya Hockey Union (KHU) following what happened at Wazalendo and Police match on Saturday. “We just want to concentrate on the remaining matches and end the league on a high,” said Owoka, who gave it to Fonteyn, who drew first blood besides playing assist to the second goal. “Fonteyn passes and knowledge of the game are awesome. You would expect that from a player who had featured in top league in the Netherlands, Germany and England,” said Owoka. Marissa Creatore found the ball after it rebounded off Virginia goalkeeper Carrera Lucas and shot it into the back of the net. It was the fifth minute and the Tar Heels had just taken an early 1-0 lead over a team they upset this time last year. On the way to a 5-1 victory over the No. 16 Cavaliers, the No. 1 North Carolina field hockey team's offense shined in the ACC Championship semifinals, which fell on a cold and cloudy day in Chapel Hill. After an undefeated (17-0) regular season, the matchup opened up postseason play for UNC on Friday afternoon. Just over five minutes after getting on the scoreboard, first-year Erin Matson shot the ball from mid circle which landed in the back of the net to give the Tar Heels a two-goal lead. UNC stepped on the gas early, putting some space between the two teams with that goal from Matson, who was named ACC Offensive Player of the Year and ACC Freshman of the Year earlier this week. Senior Malin Evert joined in and scored a goal of her own in the 12th minute off a penalty corner to pile on to the scoring. In the first half, the Tar Heels had 13 shots while the Cavaliers had one shot. With a 3-0 lead at halftime, Shelton wanted her team to continue to press. Less than seven minutes after the break, Matson scored again to help UNC take a commanding 4-0 lead. It was her second goal ever in the ACC tournament and her 14th on the season — tied with Catherine Hayden for the most on the team. The Tar Heel offense did not stop there. In the 54th minute, DuVernois shot the ball from the right side of the cage that passed by the goalkeeper and went into the net with Matson earning the assist. By the time the Cavaliers responded in the 64th minute, UNC had already protected its unblemished record and secured a matchup with Wake Forest, the No. 6 seed on Sunday in the championship game. In the game the Tar Heels will set out to make history. On Sunday afternoon, the No. 1 North Carolina field hockey team did not just win its second consecutive ACC Championship, it also broke a curse. UNC defeated No. 20 Wake Forest, 7-2, in the ACC Championship game. With that win, the Tar Heels became the first No. 1 seed in the ACC Tournament to win the championship since the format expanded in 2014. The Tar Heel offense got off to a quick start. In the second minute, first-year Erin Matson scored off a penalty corner and shot the ball behind her back. Matson’s goal even surprised some of her teammates. The Terps' offense wasn’t stellar but did enough to raise their 2nd conference trophy of the season. Maryland field hockey forward Bibi Donraadt received a pass with her back to goal, spun around and fired a shot into the bottom right corner in the 42nd minute of the Big Ten tournament championship against Iowa. Donraadt’s score gave the Terps a two-goal lead just after halftime, but the Hawkeyes answered back about four minutes later to come within one. Iowa kept the title game close but never equalized after Maryland took a lead in the sixth minute. The Terps held on for the 2-1 win that clinched their second Big Ten tournament championship in program history and first since 2015. After winning a share of the regular season conference title, Sunday’s win secured Maryland’s second Big Ten trophy of the season. “I’ve been listening to all the seniors and upperclassmen talking about how they haven’t won it since freshman year,” freshman Taylor Mason said. “To start my first year off on such a good note and a win is just so exciting. Two days after setting the conference tournament record for most goals scored in a game with a 9-1 win against Ohio State, Maryland’s offense was mostly quiet against Iowa. Through the first half, the Terps only had one shot — midfielder Madison Maguire’s sixth-minute goal. With her dad cheering from the bleachers donning half Maryland gear and half black-and-gold in support of sister, Makenna Maguire, Madison scored the game’s first goal. When the Terps and Hawkeyes met earlier this season, Maryland only managed five shots in a 2-1 victory. In the championship matchup, the Terps ended with five shots again, while the Hawkeyes had nine. With Iowa leading in shots, goalkeeper Sarah Holliday had to make five saves for the Terps. In one instance in the second half, Iowa’s leading scorer Madison Murphy beat defender Bodil Keus and created a one-on-one chance with Holliday. Holliday ran out of goal to smother the ball before Murphy could even get a shot off. Holliday was also key for the team on penalty corners. The Hawkeyes earned three corner chances and scored its lone goal on one of those chances. Maryland couldn’t convert any of its five penalty corners, but it didn’t matter. Maguire and Donraadt’s efforts were enough for Holliday and the defense. So even after a mediocre offensive showing, coach Missy Meharg ran onto the field postgame beaming and congratulating her team for its first Big Ten tournament championship since 2015. The Terps host Albany in a first-round game Friday. Maryland field hockey is the No. 2 overall seed in the NCAA tournament and will host Albany in its first-round game Friday. The Terps (19-2) will face the Great Danes (16-4) at noon Friday in College Park. The winner will advance to play the winner of Rutgers and UConn, two teams Maryland has already beaten this season. After finishing the season undefeated, North Carolina is the No. 1 overall seed. Maryland was ranked No. 2 in the country for most of the season and won the Big Ten tournament by beating Iowa, 2-1, on Sunday. The Terps shared the Big Ten regular season crown and had their best regular season since 2013, finishing 16-2 with 11 wins over ranked opponents. After losing to UConn in the national championship last season, Maryland has emphasized throughout the season that its goal is to win the 2018 title. And after raising their second conference trophy of the year Sunday, that still remained the Terps’ sole focus. Meharg has praised the increased competition of the Big Ten all season, and the tournament bracket shows why. Four other Big Ten teams — Michigan, Penn State, Iowa and Rutgers — made the 18-team field. It’s the Scarlet Knights’ first appearance since 1986 and the Hawkeyes’ first since 2012.